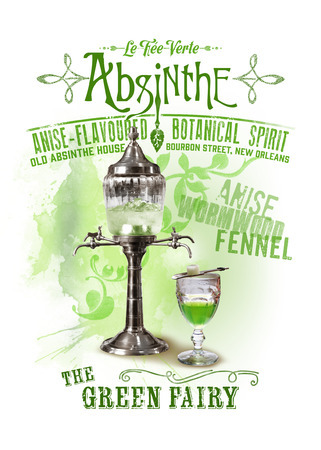 Absinthe is an unsweetened green liqueur with a taste of anise, flavoured with botanicals, primarily oil of wormwood. The oil is bitter, and contains the poison thujone – which has led to absinthe’s notoriety. The drink became very popular in France in the 19th century, but it is said that many suffered from hallucinations, seizures, or death from excessive drinking of absinthe. It was banned in many countries. Absinthe can be purchased legally in Britain. Absinthe was typically served by balancing sugar cubes on a special spoon and pouring ice cold water over the sugar cubes into the drink. Another anise-flavoured drink, pastis, has since taken absinthe’s share of the market. Indeed, a certain Monsieur Pernod purchased the original absinthe recipe in 1797 from its creator, Dr Ordinaire. That drink is also usually served diluted with water, at which time the clear liquid becomes cloudy and opaque. Absinthe’s reputation in the nineteenth century was akin to that of illegal drugs in the late twentieth century. The painter Manet depicted this in his famous painting The Absinthe Drinker (1859), in which a dejected devotee stares gloomily at the cloudy liquid in his glass. Absinthe has several nicknames, including ‘la verte’ (the green one) and ‘the green fairy’ (a reference to its alleged hallucinogenic properties). The poster above depicts these many aspects of absinthe.